Photograph of a canal in the Queen’s Garden to the south of the Nandaw (Royal Palace) at Mandalay in Burma (Myanmar), taken by Willoughby Wallace Hooper in 1886. The photograph is from a series documenting the Third Anglo-Burmese War (1885-86), published in 1887 as ‘Burmah: a series of one hundred photographs illustrating incidents connected with the British Expeditionary Force to that country, from the embarkation at Madras, 1st Nov, 1885, to the capture of King Theebaw, with many views of Mandalay and surrounding country, native life and industries’. Two editions were issued, one with albumen prints, one with autotypes, along with a set of lantern slides. Hooper made the series while serving as Provost Marshal with the British Expeditionary Force, which entered Mandalay on 28 November 1885. King Thibaw (reigned 1878-1885) was deposed and taken prisoner, and a military occupation was begun in the city. The war culminated in the annexation of Upper Burma by the British on 1 January 1886 and the exile of Thibaw and his queen Supayalat to India. Mandalay, the last capital of the Burmese kings, was founded in 1857 by King Mindon Min of the last Konbaung dynasty (ruled 1853-78). The palace stood within an inner enclosure at the heart of a huge square citadel surrounded by a wide moat. Canals ran through the gardens, with ornamental lakes, artificial grottoes and palm groves, on the north-west and south-west sides of the palace. 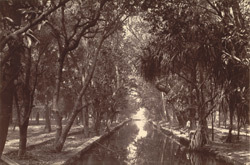 Hooper describes them in a caption accompanying the photograph: “These canals, connected with the moat outside the walls, run in various directions through all the palace gardens; on these were numerous gilded pleasure-boats, and the water abounds with fish. The gardens themselves were not kept up in any thing like decent order, and there was nothing specially attractive about them except some curiously constructed rockeries made of a kind of cement and embellished with grotesque forms of animals. There were small garden-houses, prettily carved and ornamented, in various parts of the garden, and it was in one of these, near the bottom of the canal shewn in the photograph, that Theebaw surrendered himself.” Hooper was a dedicated amateur photographer and his photographs of the war in Burma are considered “one of the most accomplished and comprehensive records of a nineteenth century military campaign”. The series is also notable for the political scandal which arose following allegations by a journalist that Hooper had acted sadistically in the process of photographing the execution by firing squad of Burmese rebels. The subsequent court of inquiry concluded that he had behaved in a “callous and indecorous” way and the affair raised issues of the ethical role of the photographer in documenting human suffering and the conduct of the British military during a colonial war.